Softrek has introduced an update to its popular Turbo ST utility program for the ST. Turbo ST patches the GEM operating system to provide quick methods of drawing text to your ST's screen. The result is a noticeable speed improvement in GEM programs that rely heavily on GEM to draw text. For example, Timework's Word Writer ST scrolls text up to 50% faster when Turbo ST is in use. 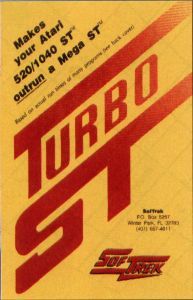 Older versions of Turbo ST had compatibility problems when using certain programs. The new version 1.2 solves 90 percent of the compatibility issues and has been tested with Flash, VIP Professional, Zoomracks II, Beckemeyer's MT C Shell, and Interlink. The new version also includes a fast VDI filled-rectangle routine. Almost every function of GEM relies on filled rectangles. For example, drawing windows, menus, scroll bars, and other objects require rectangles to be plotted to your ST screen. Turbo ST 1.2 greatly improves GEM's speed, serving as a software blitter chip. Registered users can obtain an update to Turbo ST 1.2 by returning the original program diskette plus one dollar to Softrek. A new manual is included in the upgrade fee.